January wouldn’t be January in France without a Galette des Rois or two (or ten!). They are eaten throughout the month of January, until they finally disappear once February arrives only to resurface again near the end of December the following year. A lof of people believe they are called the kings cake to celebrate the Wise Kings arrival at the stable on January 6th but apparently the actual reason goes back to a roman celebration. At the time, to celebrate the winter solstice, families would have a ‘raffle’ to pick a king who would be King of the household for the day. Even the servants could take part and if they won, could end up bossing their employer around for the day. 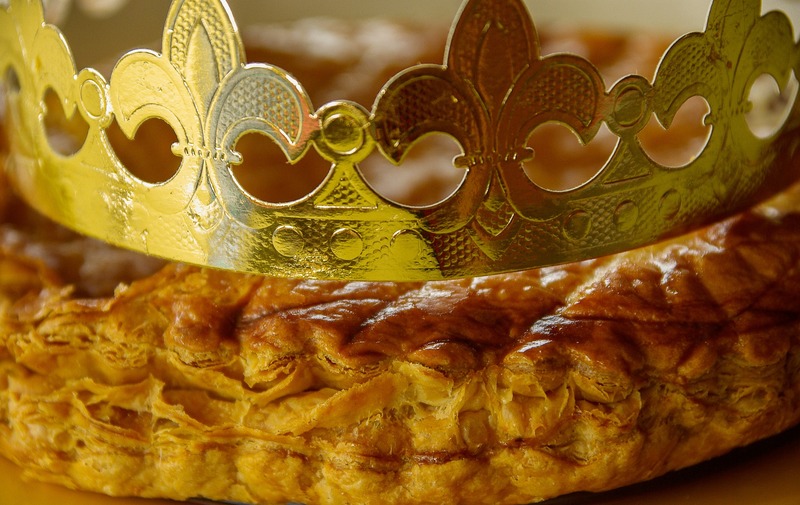 The Galette des Rois below with puff pastry and almond filling is common all over the north of France, but in the south of France their ‘galette’ is a completely different cake made with a ring of brioche and candied fruit. In France the tradition is that the youngest member of the household goes under the kitchen table while the ‘galette’ is being cut and calls out the names of those present as each slice is served up. Whoever finds the fève is the king – or queen!